Mike Ryan, a Navy veteran, moved some of his belongings into his new apartment at Montello Welcome Home Agai in Brockton. Mike Ryan doesn’t eat processed foods. He exercises frequently and drinks detox juices every day. After 15 months of homelessness, one of the first things the 56-year-old Navy veteran did when he moved into his Brockton apartment was to set up his blender. 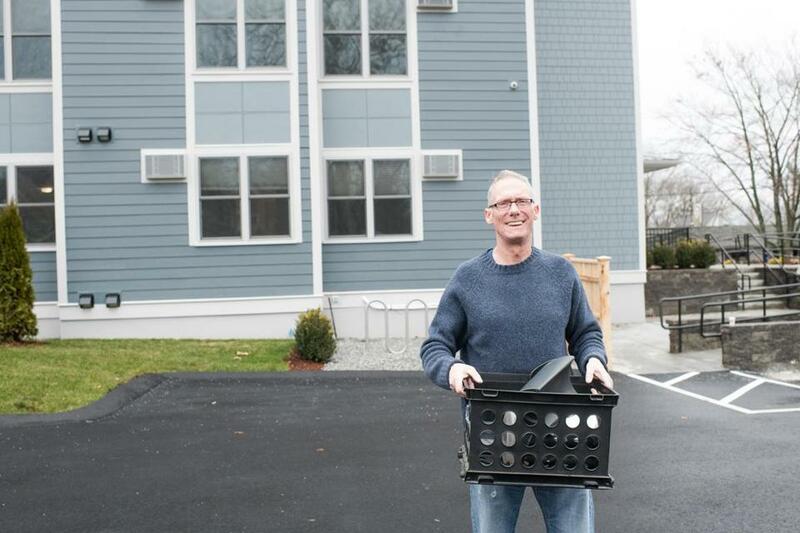 Ryan was among the first tenants to move into Montello Welcome Home Again, a new apartment building in Brockton developed by Father Bill’s & MainSpring, a nonprofit dedicated to ending homelessness. The building opened last month at 682 North Main St. with 23 units of supportive housing for chronically homeless individuals, including 12 units set aside with a preference for military veterans. Father Bill’s & MainSpring is no amateur when it comes to building housing for the homeless, managing five shelters and 19 permanent housing properties across southern Massachusetts. The organization’s smallest building in Hingham has five units, while its largest in Brockton has 32. Yet the nonprofit knows its work isn’t over. “We are not trying to manage homelessness as a mission, we are trying to end it,” said John Yazwinski, chief executive officer and president of Father Bill’s & MainSpring. In January 2018, the organization counted 1,090 homeless adults and children in its service area, which also includes Quincy, Weymouth, and Plymouth. Montello Welcome Home Again was built on the site of the old Phaneuf Hospital, which had been vacant for about a decade before Father Bill’s & MainSpring purchased the property, Yazwinski said. Ninety-eight people applied to receive housing in Montello Welcome Home Again, and residents were chosen through a lottery system. The residents have leases and pay 30 percent of their income as rent. The project cost more than $5 million, of which $2.6 million came from the Massachusetts Department of Housing and Community Development. The rest came from the city of Brockton, fund-raising, and donations. Mayor Bill Carpenter spoke at the opening dedication for Montello Welcome Home Again and acknowledged that his perspective on supportive housing for the homeless had changed over time. Several years ago, when Father Bill’s & MainSpring was attempting to build supportive housing for the homeless at 695 North Main St., Carpenter’s administration refused to issue a permit for the project, sparking a legal battle. Jack’s Place and Patti’s House ultimately opened in 2016. In hindsight, Carpenter said in an interview, he realized that he opposed the first project because he didn’t understand it. He said he was influenced by small business owners who envisioned “all kinds of people hanging out outside all day long” who would drive away customers. But once he saw the project’s positive results in the community, he became a fan of the organization’s work. “I don’t know how we are ever going to address homelessness if we don’t build rooves and put people under them,” Carpenter said. The Father Bill’s & MainSpring housing program is rooted in the concept of permanence. Each resident is assigned a caseworker. The individual also can take part in the WorkExpress program, which partners with local businesses and municipalities to give residents jobs that will benefit the community, such as graffiti removal and apartment rehabilitation. For Ryan, who had battled substance abuse, the chance to live at Montello Welcome Home Again has transformed his outlook. Ysabelle Kempe can be reached at ysabelle.kempe@globe.com.